Every day, companies across the U.S. are involved in the research and development of new products that stimulate the life and growth of our country. These products result from the contribution of engineers and engineering principles, while also providing an overall benefit to society. The National Society of Professional Engineers is seeking those innovative products and their inventors for consideration in the New Product Awards program, which provides wide recognition for both the products and the companies that create them. 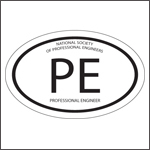 The awards program is sponsored by NSPE's Professional Engineers in Industry. "Innovation and research have always been the cornerstones of new product development, and engineers contribute significantly to both," said Richard Buchanan, P.E., chairman of the New Product Award Committee. "This prestigious award serves to not only recognize the engineering that goes into these new products, but also the forward-thinking ability and initiative of the companies who are bringing these products to light." Celebrating its 26th year, the prestigious New Product Award competition recognizes companies whose pioneering vision and design bring new products to the marketplace, while highlighting the societal benefits of these new products. These benefits include a direct and unique impact on the public's safety, added employment, increased productivity, economic development, the strengthening of the nation's competitive position internationally, and a significant contribution to the public's standard of living. As part of the award format, all entrants will have the opportunity to showcase their products at the 2009 NSPE Annual Conference in St. Louis and winners will receive two tickets to the award presentation. Acknowledgment in a "Winners' Circle" ad in PE magazine. Entries are judged on the product's improved function, sales and economic impact, and innovative use of engineering principles. Nominations are grouped according to size of the industrial company, and winners are selected in four employment categories: small (50 or fewer employees), medium (51 to 200 employees), large (200 to 9,999 employees), and mega (10,000 or more employees). Past winners include Salazar Machine & Steel, AuthenTec Inc., InSinkErator, and Cummins Emissions Solutions. To be eligible, each submission must be for a product, machine, process, or material that has been developed in the U.S. and first placed on the market between 2003 and 2007. A $250 entry fee includes participation in the 2009 New Product Awards Showcase during the NSPE Annual Conference in St. Louis. Entries should contain a detailed product description and include photos, brochures, and samples, if possible. The deadline for delivering entries to NSPE is February 15, 2009. To review the rules and receive an application, visit www.nspe.org/npa or e-mail pei@nspe.org.